For families all across the country, the traditional Christmas Eve dinner is celebrated with lobster as either the main course or a first course. This year, for many chefs, baked stuffed lobster tails will take center stage. Here is a traditional baked stuffed lobster tail recipe, courtesy of Chef Christopher Russel of Boothbay Harbor, Maine. Russell is a former Maine Lobster Council Chef of the Year. Plan on one 1-1/2 pound-lobster per person, or if convenience dictates, fresh or frozen lobster tails may be purchased instead of whole live lobster. Boil salted water in a large kettle or pot. Cook the whole lobsters for 5 minutes. Remove lobsters and place in an ice water tub to cool. Crack and pick the meat from the claws, knuckles and body. Chop lobster meat into bite-sized pieces. Set aside. Split the tails lengthwise down the center with a sharp knife, being sure to keep the shell-side of the lobsters facing up. Make sure to keep the shells intact. Remove the tail meat from the shell and remove the intestinal track from the meat. Then carefully insert the whole tail meat back into the shell. For the stuffing, melt the butter in a skillet over medium heat. Add the chopped onion. Sauté until soft. Stir in the parsley, Old Bay seasoning and lemon juice. Remove the skillet from heat and let cool. Stir in the chopped lobster claw and knuckle meat. Gently add in the cracker crumbs and stir. Using a spoon, add the the stuffing into the lobster tails. Refrigerate the lobster tails until ready to bake. When ready, preheat the oven to 425-degrees . Bake the tails until the stuffing is golden and crisp, about 15 – 20 minutes. Serve immediately with wedges of lemon and let the dinner party begin! Along comes November in New England and the tree leaves along the lobster coast are turning into an ocean of color. The days are shorter, evenings cooler and once again it’s time for a hot bowl of homemade Boston Lobster and Corn Chowder. Made with Fresh Maine lobster and freshly harvested corn on the cob, this seasonal chowder makes a great meal for the Fall. The Boston Lobster and Corn Chowder recipe* includes cooking a lobster stock so it will take about two hours to prepare. The recipe will provide 4 to 6 bowls or more of chowder. While the recipe is a favorite for the Fall when fresh corn is available, it can be made year round with seasonal corn or fresh frozen kernels. Use a 10-quart stock pot filled two thirds with sea water or fresh water heavily salted, bring water to roiling boil and add the live lobster one at a time. You only want to blanche the lobster by cooking four to six minutes. Remove the lobster and set aside to cool. Crack the shells with a large chef knife and pick all the meat from the tails, claws, legs and bodies. Remove the intestinal track from the cartilage and tail. Dice the meat into ¾ inch cubes, cover and refrigerate. The bodies and left over shells will be used in the lobster stock. The stock will take more than an hour to prepare so that must be the next step (see Lobster Stock Directions below). While the lobster stock is simmering, husk the corn and rub with a dry towel to remove all the silk. Carve the kernels from the cob and set aside. Break the cobs in half and add to the simmering lobster stock. When the stock is ready, using a six-quart pot, heat the bacon until golden brown and pour off all but one tablespoon of bacon grease. Add butter, thyme and onion and sauté until onions are soft. Add paprika and stir about two minutes. Add the potatoes, corn kernels and enough lobster stock to completely cover the potatoes. Increase heat and bring pot to a boil. Cover and cook for 12 minutes until the potatoes are just softened on the outside. Add the lobster meat and the cream and remove the pot from the heat. Season with salt and pepper. Allow to stand a few minutes for flavors to meld. To serve, spoon the lobster, potatoes and corn into a large bowl and then ladle in the creamy broth. Garnish with chives and chopped parsley. Use a six or eight-quart stock pot. Add the lobster carcasses, shells and tomalley to the pot. Cover with water and bring to a boil. Skim any scum from the surface. Reduce heat to a fast simmer. Add the wine, tomatoes, onions, celery, carrots, garlic, thyme, bay leaves, peppercorns and fennel seeds. Let simmer for an hour or more until the flavor is rich. Strain the stock though a fine mesh and draw off enough to add to the chowder as required. Any extra stock may be frozen and kept up to two months. * Traditional Lobster and Corn Chowder recipe made famous by Boston chef Jasper White. Steaming or boiling lobster. Which is best? Steaming or boiling lobster? That is the question. Lobster chef’s everywhere will be pondering the same old question. Whether “tis better to boil or steam a live lobster. What’s the best lobster recipe? Boiling a Maine lobster is the easiest way to cook and serve a whole lobster and a boiled lobster is easier to pick clean. When you have that large picnic or party and the kettle is kept full all day with lobster, boiling is just so much easier. But steaming a lobster often yields the best results for eating. Here’s why: steaming is a more gentle process of cooking the meat and it preserves more flavor and tenderness. Steaming a lobster is also more forgiving on the chef since it is harder to overcook a lobster in a steam pot. For true lobster lovers, steaming is the way to go. First step is to order some freshly caught, hard shell Maine lobster. Hard shells are recommended as the lobsters are usually stronger and healthier and the hard shell lobster will have the most meat. Then choose a big four to five-gallon kettle or pot with a tight lid. This size pot should be able to easily handle up to eight pounds of lobster. Remember, don’t crowd the lobster into the pot or you will get uneven results. It is best to have the right size pot. Add two to three inches of sea water to the cover the bottom of the pot. If you don’t have access to the Atlantic Ocean, don’t worry. Use filtered fresh water and add lots of sea salt: one to two tablespoons per quart. Place a steaming rack inside the pot and use high heat to bring the water to a rolling boil. If you wish, you may remove the rubber lobster claw bands. Place the live lobster one at a time and head first into the pot and cover. Start timing the lobster and do not overcook. *Reduce time by 3 minutes for soft shell lobster. Half way through the allotted cook time, open the lid and move the lobster around in the pot. It is important to shift the lobster so they all cook evenly. If necessary, you may add a little more water but no more salt is required. The most important step for all lobster chefs is determining when the lobsters are done. The first rule, do not to overcook the lobster. 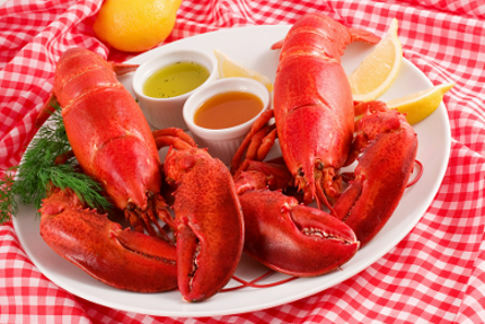 A lobster shell will be bright red when fully cooked and the meat white. So what’s the best way to tell when the lobsters are done? Care must be taken with large lobster as they will be red but they may not be fully cooked. And a lobster in the top of the pot may not have cooked as fast as one at the bottom. One popular practice is to give one of the lobster antennae a good pull while the lobster is still in the steamer pot. If the antenna pops off, it is a good sign the lobster is done. Another step is to use tongs to remove one lobster and cut a small slice at the bottom of the tail. If the meat is fully changed form translucent to white, it’s done. Note: The lobster will continue to cook for a minute even after it’s taken out of the pot, so again, do not overcook. Allow steamed lobster to drain for a minute. You may pierce the body and tail with a knife to help drain the water. Then serve the lobster right away with a side of melted butter and a slice of lemon. To make eating fun and easy, serve with lobster bib and steel cracker accessory kits. Author WaynePosted on October 8, 2018 March 1, 2019 Categories Cooking lobster and recipesTags cooking lobster, lobster recipe, steaming lobster2 Comments on Steaming or boiling lobster. Which is best? No holiday is more New England than Thanksgiving. The holiday dinner is based on Pilgrim lore. So adding a first course of steamed Maine lobster served in the shell with nutmeg vinaigrette and chestnut puree would add a wonderful dimension to the Thanksgiving tradition. Not to mention being a big hit for guests and family. The lobster recipe is from Boston celebrity Chef Todd English who is on the record for being a big fan of Thanksgiving day lobster. The recipe first appeared in Food and Wine Magazine. It is recommended that the nutmeg vinaigrette and chestnut puree be prepared the day before. The lobster recipe calls for 10 1-1/4 pound live lobsters steamed, and then halved with the lobster meat served in the shell. The recipe will serve 20 people. In a large saucepan, combine 1 cup of the stock with the cider, shallots, bay leaves and sherry vinegar. Boil over high heat until reduced by half, about 25 minutes. Add the heavy cream and nutmeg and simmer over moderate heat until slightly thickened, about 5 minutes. Remove from the heat. In a medium saucepan, heat the vegetable oil. Add the onion and cook over moderate heat until softened. Add the remaining 1 cup of stock and the chestnuts and simmer until the liquid reduces by a third, about 4 minutes. Remove from the heat and add the maple syrup and butter. Transfer the contents of the saucepan to a blender and puree until smooth. Blend in the crème fraîche. Transfer the puree to a clean saucepan and season with salt and pepper. Cover and keep warm. Gently reheat the nutmeg vinaigrette. Add the scallions and parsley and season with salt and pepper. Cut the lobster tail meat into 1-inch chunks and replace it in the tail sections of the lobsters. Spoon half of the chestnut puree in the center of each of 2 large platters. Arrange the lobster halves around the puree. Spoon the warm nutmeg vinaigrette over the lobsters, garnish the platters with the greens and serve at once. MAKE AHEAD The lobster recipe can be prepared through Step 2 and refrigerated overnight. Finish the vinaigrette and rewarm the chestnut puree before serving. SELECTING A WINE The natural saltiness of lobster, as with any seafood, will amplify the flavor of a big fruity Chardonnay. Go with a first course Chardonnay that is gently touched with fruit, and mostly un-oaked. Lobster Fra Diavolo, the dish by which all other seafood dishes are judged! Be forewarned, preparing this seafood feast it not for the feint of heart. But the wonderful culinary rewards are worth it. To introduce our dish, you should know that “Diavolo” is Italian for devil. As a culinary term it is used to describe a tomato based sauce that is liberally spiced, with “Fra Diavolo” the Italian term for brother devil: a spicy sauce prepared with linguine and fresh seafood. Our dish calls for preparing a homemade lobster stock made from fresh Maine Lobster. A favorite of Boston’s North End, the Boston Lobster Fra Diavolo recipe will feature lobster, clams and mussels and take four and one-half (4 ½) hours to prepare both the homemade lobster stock and the sauce. The recipe will serve four to six people. The first step is to prepare the lobster stock. This begins by blanching the live lobsters, cracking the claws and tails and removing the meat. Set the lobster meat aside. Please see the directions for the lobster stock preparation below. Bring 1-gallon of salted water in large pot to a boil and add the pasta to the pot. Partially cook for 5 minutes, drain and drizzle with olive oil. Set aside. While cooking the pasta, place a 14-inch sauté pan over medium-high heat and add the olive oil. Once the oil is hot, add the onions to the pan and cook until caramelized, about 2 minutes. Add the garlic and shallots and sauté until fragrant, about 30 seconds. Add the red pepper flakes and sauté about 30 seconds. Add the tomato sauce and tomato paste. Cook the ingredients until reduced by half, about 5 minutes. Add the clams to the pan, cover and cook about three minutes. Add the mussels to the pan, cover and cook about three minutes. Add the lobster to the pan and cook for two minutes. Add the parsley to the pan. Add the partially cooked pasta to the pan. Add 1 ½ cup of the lobster stock and continue to cook. Toss the pasta in the sauce until al dente, about four to five minutes. Season the pasta with the salt and toss again. Garnish with fresh basil and serve. Heat vegetable oil in large stock pot. Add the empty lobster claw and tail shells and stir. Cook for 5 minutes. Add the carrots, celery, tomatoes and thyme. Cut the fennel and garlic bulbs in half and add to the pot. Cover ingredients with two inches of water. Bring pot to a boil, then reduce the heat and simmer until mixture is reduced by half (about 4 hours). Add salt and black pepper to season. Strain stock and set liquid aside. The recipe screams to be served with a sparkling Rose Champagne or a light, traditional Chianti. The next time you invite the family over for a lobster outing try this traditional old-time favorite Maine lobster steamed-in-beer recipe. It’s a fun, easy way to prepare lobster and gives the lobster a great, robust down-east flavor. You will need a pot or steaming kettle large enough to hold six lobsters, some seasalt, beer, fresh whole lemons and butter. That’s it. If you don’t have seawater, add two tablespoons of sea salt. You need to add salt even if you use all beer. Always add salt when cooking live lobster. Add two 12-oz. cans of beer, IPA beer is a good choice. Don’t use light beer. Bring the water and beer to a roiling boil over high heat. Remove the rubber bands from the claws and add the lobsters head first. Cover tightly. Wait for the pot to return to boil and start timing. Steam the lobsters 14 to 15 minutes. About halfway through, stir the lobster at least once to move the bottom lobsters to the top of the pot. Melt the butter in small pan and slice the lemon into wedges. When done the lobsters will be a bright red and the tails will be curled under the body of the lobster. Remove the lobsters with tongs and pierce the body with chef’s knife to allow water to drain. Serve immediately with melted butter poured in ramekins, lemon wedges and cracking utensils. Note, if you want to cook different size lobsters you can. For each pound, cook the lobster 13 minutes. Then three minutes for each additional pound. While steaming is a flexible way to prepare lobster, be careful not to overcook. If you want to try this easy to prepare recipe and can’t go to Maine, live Maine lobster is now available for home delivery. Check out this steamed in beer lobster video from Capt. John of Maine. He takes you from boat to table with his easy to prepare recipe. With the Fourth of July just days away, the outdoor entertaining season with fresh Maine lobster is moving into full swing. With the lobster menu decided upon, the question that always comes up is what are the best wine and lobster pairings? First of all, let’s answer the question that is most asked. No, you can not serve red wine with lobster. The tannin in red wine and the iodine in lobster will react, overpowering the delicate flavor of the lobster, giving the meat a metallic taste. Therefore, no red wine, not even Beaujolais or other kind of low-tannin red should be served. The Gamay of even a subtle red will over power the lobster. The only exception is Lobster fra Diavolo, when Chianti is the only choice. But that discussion is for another day. Today we are entertaining outdoors and a traditional steamed lobster dinner is on the menu. So what wines are most enjoyable? I will start out by saying beware of serving robust white wines such as the new types of Chardonnay that have overly vibrant fruit flavoring. 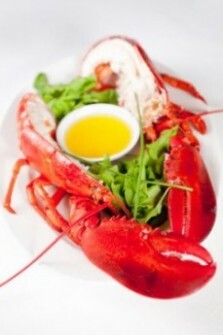 The natural saltiness of lobster, as with any seafood, will amplify the flavor of a big fruity Chardonnay. So unless you are grilling your lobster, go with a Chardonnay that is gently touched with fruit, and mostly un-oaked. 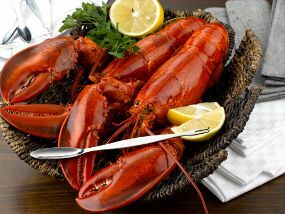 For us, we prefer steamed lobster with a white burgundy such as Louis Jadot Pouilly-fuissé (2008 $18.99). This wine has wonderful Chardonnay flavors, minerals and just a bare touch of oak. The perfect pairing for enjoying the sweet, delicate taste of warm lobster dipped in melted lobster butter. The first course should be Wellfleet oysters. They must be shucked and served as an appetizer. On a large platter covered with plenty of ice, arrange the oysters in circles with traditional New England red cocktail sauce, lemons and horse radish … the only way to serve oysters. What wine to pair with raw oysters? The world’s perfect oyster must be served with the perfect Champagne. We enjoy Taittinger Champagne La Francaise ($27.99). This sparkling wine has a high blend of Chardonnay grapes to yield a balance of stone fruit and crisp hints of bread crust. One sip of chilled Champagne, followed immediately by a world famous Wellfleet oyster, and your taste buds will explode. Trust me, you will love it. The steamers and chowder should be served as the second course well before the lobster and paired with a zesty Chardonnay. I enjoy pairing the clams with La Crema Montery Chardonnay (2009 $20.00). This is a wine with its own fresh mineral notes and tropical aromas of lemon that will nicely pair with the sweet, ocean flavor of the steamer clams. Just chill the wine and serve. Wellfleet Oysters and Taittinger Champagne; La Crema Chardonnay and Maine steamer clams (or shrimp); and of course, Louis Jadot Pouilly-fuissé and lobster; sweet, fresh lobster will all contribute to a memorable outdoor dining experience. The perfect pairings of three wines with three courses of all the best seafood New England has to offer will have your dinner guests abuzz. Believe us when we say, it does not get any better than this. Just let us know what time we should be there for dinner.